“A gathering of international chatterers for the purpose of chattering.” The birth of the OECD’s Committee on Fiscal Affairs. In my previous post I explored the United Nations’ brief post-war flirtation with a Fiscal Commission, which came stuttering to a halt in 1951 due, it seemed, to the lack of a compelling purpose that might have motivated states to fight to retain it. The United Kingdom had supported a Russian proposal to wind up the UN’s tax work, a position that seems consistent with its subsequent opposition to the creation of what is now the UN Committee of Experts on International Cooperation in Tax Matters two decades later. It’s perhaps more surprising that, as we will see, the British were initially opposed to the creation of a Fiscal Committee at the Organisation for European Economic Cooperation (OEEC), the predecessor of the OECD, as well. Today the UK is a strong supporter of the OECD’s position as the dominant site of international tax cooperation, but it did not start out that way. We begin, as the League of Nations’ tax work did, with a resolution of the Executive Committee of the International Chambers of Commerce resolution, in 1954. The resolution identified double taxation as a “serious obstacle” to trade and investment in Europe, and for OEEC members to take steps to relieve it. It asked for unilateral measures, bilateral treaties and, ideally, a multilateral convention. The OEEC’s secretary general was sceptical that the organisation could add any value here, especially given that the UN had not at this point formally dissolved its Fiscal Commission. Soon after this, Switzerland and the Netherlands began to circulate proposals for a fiscal commission. In a curious echo of the current debate around digital taxation, these proposals all expressly mentioned turnover taxes, increasingly imposed by states on the rendering of services, as the main new problem motivating their concerns. In March 1956, the Fiscal Committee was created, against the judgement of the British and Scandinavians. Britain’s attitude throughout had been sceptical, but acquiescent. The British representative, Sir Hugh Ellis-Rees, “criticised the memorandum for being vague and for not revealing what the usefulness of the study would be, nor what were its precise objectives.” On the other hand, he told the Inland Revenue, “I think that in our position in the organisation it would be tactically unwise to try to suppress at this stage a movement which has some support however ill-founded it may turn out to be.” Two handwritten notes in the Inland Revenue files are worth quoting at length here. One is from Alan Lord, who eventually sat on the Committee for the UK. We regard the whole idea as, if I may borrow the FO [Foreign Office] words, “futile and unrewarding” or, in cruder terms, as a gathering of international chatterers for the purpose of chattering. We must, in the interests of international unity, agree to attend a meeting, which is [illegible] but if anything on this should turn up with Mr Daymond and [illegible] you will no doubt determine your answer by reference to our Policy of being Against It. The author of the second note is unidentified, but it shows how the UK viewed the Swiss and Dutch proposals, as well as – in the third paragraph – a pessimism that seems rather anachronistic when compared to the kind of work conducted by the OECD today. 2. If this be so, the answer to (i) is that we regard this exercise, to use the FO phrase, as “futile and unrewarding” and (ii) that this is a private fight in which we do not wish to join. 3. There seems to have been later on a ganging up of Germans, Swiss and Dutch to give a regrettable academic flavour to the whole thing and to discuss domicile, “classification of income” and “localisation of income”, whatever these terms may mean. Presumably some attempt to reach, for example, agreement on whether interest should be charged by reference to origin or residence, an exercise which long experience has shown to be pointless. The British concerns were, I think, unfounded, as the new committee raced through a list of five thorny areas within a year, finding consensus on topics such as permanent establishment and the taxation of shipping and airlines, which are recognisable today as core components of the OECD model convention. The most recent document in this particular file is an interim report from the Fiscal Committee in 1957. It shows how within 18 months the committee was already consolidating its ways of working (Working Parties on each specific issue, just as the OECD has today) and forming a clear raison d’être. In the excerpts below, I’ve picked out three things that struck me from the committee’s interim report. First, how forcefully it began to make the case for tax cooperation, as European economies became more integrated. Second, the recognition that other countries might be incentivised to follow Europe’s lead, because of its “placement in the world economy.” It is interesting to reflect on how much this echoes the EU’s tax cooperation efforts today, perhaps more so than the OECD, for which the economic power of its members complicates its authority. Finally, the committee members had already begun to “harmonise their views”, perhaps the first conscious expression of what would become a powerful driver of successful tax cooperation: the formation of a consensus about how to do tax among an international community of practitioners. Almost all histories of the international tax regime begin with the League of Nations: from the model conventions issued by its Fiscal Committee in 1928, to the Mexico and London draft model conventions. The latter was agreed by a group of primarily European countries in 1946 at Somerset House, just across the road from where I am now. The League never reconciled the differences between the two conventions, and so the modern history of the regime is usually dated from 1963, when the OECD’s Fiscal Committee first agreed an OECD model bilateral tax convention. For the last 50 years, the OECD model has been the foundational text of the international tax regime, even forming the template for its United Nations equivalent. While I knew that the United Nations initially tried and failed to pick up the League’s work, the interregnum between 1946 and 1963 is often raced over quite quickly in tax history stories: Sol Picciotto devotes five pages to it in his magisterial International Business Taxation [pdf]. So I decided to sit down in the British National Archives to see what I could find out about this intervening period. 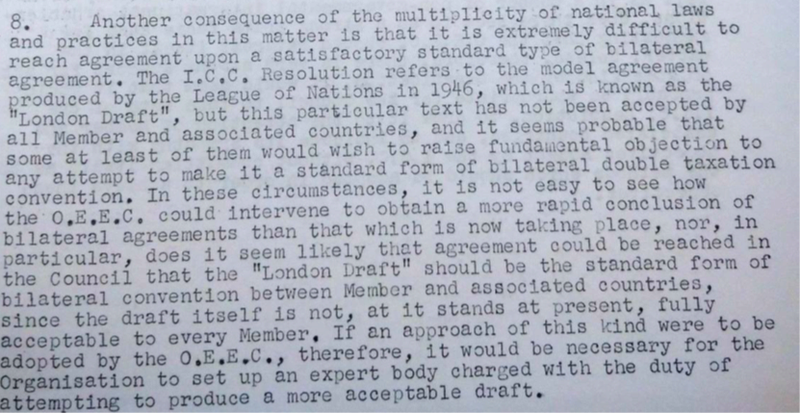 The transition from the League to the OECD is important because it is often stated that the OECD picked up and ran with the London Draft, which suited the interests of its members. The Mexico draft, largely agreed among developing countries, fell to one side, according to this account, paving the way for an international tax regime that has a bias in favour of capital exporting states. While I will shed a bit of (sceptical) light on this in what follows, I am mainly going to tell the story through some of the more colourful excerpts from the archives. Today we will look at the UN Fiscal Commission, and I’ll follow this up next week with the OEEC (later OECD) Fiscal Committee to which the baton passed. The sense one gets from both the official reports of UN Fiscal Committee meetings between 1947 and 1951, and the British participants’ own readouts, is that political divisions between groups of states were less problematic than the lack of a clear and compelling mandate to achieve anything in particular. In the committee’s first session, it was the participant from the United States who drafted the proposals for further work that made their way into the final draft, even though he also initiated a protracted (and familiar) discussion about being realistic given limited secretariat resources. Indeed, at the second session, “the secretariat work had been unevenly done and was on the whole badly presented”, said the British participant, WW Morton, who regarded the secretariat’s approach as “over-academic”. (There is a theme of hostility towards things being ‘academic’ in these Inland Revenue files, which I am not taking personally). By this point, cold war divisions had already emerged, although the sense from the British accounts is that they were not insurmountable, since the Soviet group was content on occasions to make its statements and then abstain from votes, or else be outvoted. Still, here is a flavour of the kind of thing, taken from Morton’s readout. He describes the member from the USSR stating that international work on double taxation put “pressure on the under-developed countries to the advantage of highly developed countries” since it primarily reduced the taxation of their investors. Of the second session, Morton observed that “the session was not very productive” but was keen to support anything that might allow the UK to conclude more tax treaties with developing countries. Everyone could agree to support information gathering and dissemination, and the translation of the secretariat’s compendium of international tax agreements into Spanish was something the British supported enthusiastically, keen as they were to obtain tax treaties with Latin American countries (more on that here). 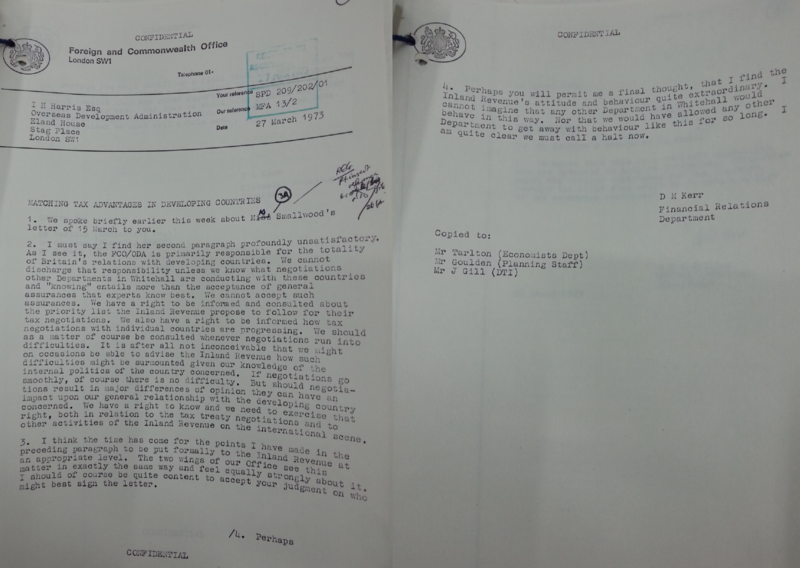 Morton, the British representative on the Commission, had previously reported an informal conversation with Morosov from which he concluded that this language was more of a formality, and that Russian objections were far from fatal to the Commission. 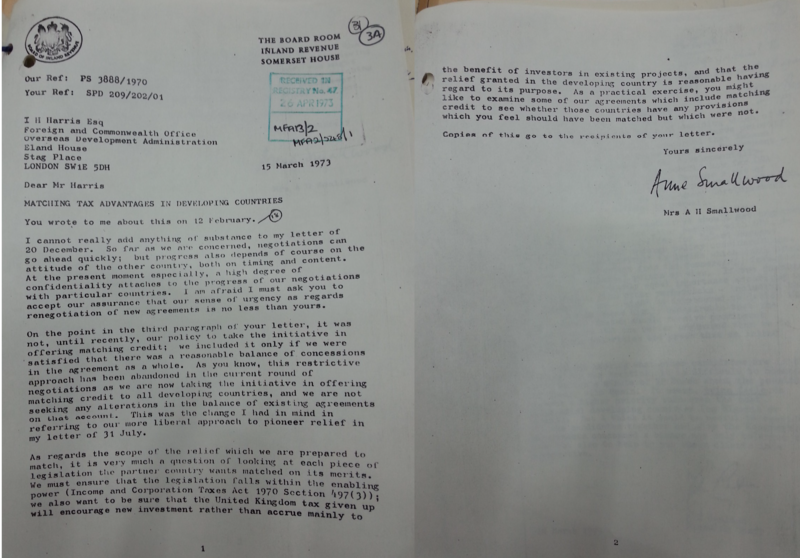 It was thus the British who really plunged the knife in to the Commission, responding that the UK was “in agreement with the Soviet Union and Polish delegations as to the desirability of winding up the Commission’s activities, although for other reasons than those advanced by them.” The UK wanted to see preparatory work for ECOSOC discussions carried out by “small groups of experts with the assistance of the Secretariat,” rather than by a permanent functional commission serviced by a dedicated secretariat. This would appear to have been the death knell for the UN Fiscal Commission, which was wound up in 1954. What is the role of the Department for International Development in the UK’s treaty policy with respect to developing countries? None, on the basis of the reply from the minister, David Gauke. Why is there no cost-benefit or development impact analysis of the UK’s treaties with developing countries? Mr Gauke said that it would not be possible to do this in a meaningful way, although as this post by Francis Weyzig points out, Ireland and the Netherlands have both now published analyses that do consider the effects of their treaties on developing countries. Does the UK government bear any moral responsibility for the outcome of a negotiation with another sovereign state? That is certainly an interesting point for further consideration. This was a good start in comparison to last year’s discussion of the UK-Zambia treaty, but these topics were still only skated over. The format of these ‘debates’ is always the same: the opposition shadow minister asks some questions, the minister responds from his briefing notes, and then the committee votes ‘yes’. It is near impossible to have a real discussion about substantive matters, such as the UK’s red line on a withholding tax clause for technical service fees (discussed below). This is partly because of the mountain of treaty detail within which substantive issues are hidden, but also because all parliament can do is vote ‘yes’ or ‘no’ after the treaty has been signed. There are two things the UK could do about this, which other countries have done. First, it could commission a comparative review, along the lines of those that have now been conducted for Ireland and the Netherlands, which highlights the main distinctive features of its treaties with developing countries so that non specialist MPs can engage with them meaningfully. Second, it could publish its treaty negotiating position, as Germany and the US have both done, with an opportunity for public and parliamentary debate on this position in general terms. Now, some technical discussion. The night before the debate, I bumped into one of the British negotiators, who said he was “not very impressed” with my post on the treaty. The next day, the Labour opposition asked some questions based on input from ActionAid, which followed the same lines as my comments. The minister responded with much the same criticism I’d heard the previous night, so I’m going here to set the record straight on the technical points, insofar as I can from my non-technical background. I stated last week that “this treaty does not include a clause permitting Senegal to tax fees for technical services paid to the UK,” but this was imprecise wording. As Mr Gauke pointed out, the treaty does permit such fees to be taxed in Senegal, but with a major restriction. They can only be taxed in Senegal if the British recipient of the fees has a physical presence in Senegal for 183 days in a year. Even then, the fees can only be taxed as net profits, not gross fees as the standalone clause would have allowed for. The whole debate at the UN on this clause begins from the view that a physical presence is increasingly irrelevant in the 21st century economy, and that it is very difficult for developing countries to get an accurate view of a service provider’s net profits. As the minister continued, “Senegal’s approach to the taxation of services differs from that of the UK,” and this is one area where the UK approach prevailed. This appears to be a red line for the UK now, but it’s worth noting that (on a quick count) Great Britain has nine treaties with sub-Saharan countries that do permit them to tax technical services without a physical presence. Senegal is arguably therefore disadvantaged relative to quite a few of its regional neighbours. On-site planning and supervision of the erection of a building are covered by paragraph 3. States wishing to modify the text of the paragraph to provide expressly for that result are free to do so in their bilateral conventions. According to the UN Model, supervisory activities are covered by this provision, irrespective of whether they are performed by the main contractor or subcontractor. The OECD Model does not include these activities in the text of the construction clause. According to the OECD Commentary, supervisory activities were, until 2003, explicitly subsumed under the construction clause provided the work was performed by the main contractor itself. Supervisory activities performed by a subcontractor were not, however, considered to be covered by this provision. This difference between the OECD and UN Models disappeared due to the changes to the OECD Commentary in 2003. The supervisory activities of a subcontractor were then also considered to be covered by the provision. Bulgaria does not adhere to the interpretation, given in paragraph 17 of the Commentary on Article 5, and is of the opinion that supervision of a building site or a construction project, where carried on by another person, are not covered by paragraph 3 of the Article, if not expressly provided for. Rents in respect of cinematograph films are also treated as royalties, whether such films are exhibited in cinemas or on the television. As the OECD Model does not include, in the definition of the term “royalties”, payments made as a consideration for the use of, or the right to use, films or tapes used for radio or television broadcasting, the UN Model deviates in this respect from the OECD Model. Back in February, the UK and Senegal signed a bilateral tax treaty. The treaty is up for ratification this week, so I thought it time to take a look. Ratification happens through the delegated legislation committee, and entails very little debate. The last time a treaty between the UK and a developing country was ratified, I thought it was a shame that there had not been more discussion, which is why I’m writing in advance this time. I’ve also commented in the past, as did ActionAid and Mike Lewis, on the Danish treaty with Ghana. So what questions might an interested Shadow Financial Secretary ask during this ratification debate? Here are three suggestions. First, they might ask about a few of the provisions within the treaty that disadvantage Senegal and that seem to go against modern negotiating trends. The table below shows some provisions within the UK-Senegal treaty that follow the OECD model (which favours the developed country) rather than the UN model (which is supposed to reflect a good balance in a negotiation between a developed and a developing country). The first of the three percentage columns shows that these are all provisions that have been included in the majority of treaties signed by developing countries in recent years; the second shows that they are included in the majority of Senegal’s treaties; the third shows how often the UK has conceded them to developing countries. The treaty is particularly unusual in that supervisory activities associated with a building site in Senegal conducted by a British firm will not be taxable in Senegal, nor will royalties paid to the UK for radio and TV programmes broadcast in Senegal. Both of these provisions are included in around 90% of tax treaties signed by developing countries, but are omitted from this one. It would certainly be interesting to ask why. Second, it is notable that this treaty does not include a clause permitting Senegal to tax fees for technical services paid to the UK. This is something that Senegal’s chief negotiator has for years advocated strongly for, including in this submission to the UN tax committee [pdf]. The UK has many older treaties with developing countries that include this provision, but more recently it seems to have changed position, opposing them. In this negotiation, it looks like Senegal made a concession on this point. This is a contentious issue at the UN tax committee, but the committee – which has members from the UK and Senegal – looks to be heading towards including it within its model treaty. It would therefore be very interesting for politicians to debate the UK’s position. Third, the ratification debate on this treaty could be an opening for a broader discussion of what the UK aims to achieve through its tax treaties with developing countries. To set this in context, in the chart below, every point represents a tax treaty signed by a developing country, with the vertical axis showing how source-based it is (that is, how much its content permits the developing country to tax investors from the treaty partner). The higher the point, the more the balance of the treaty tends towards the developing country’s favour. There’s a leisurely upward trend. 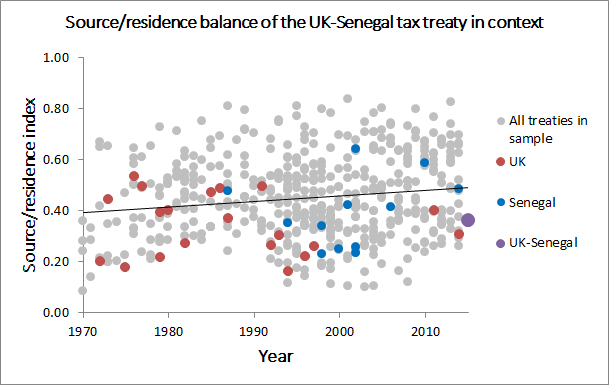 The UK’s agreements with developing countries are in red, while Senegal’s are in blue. The UK-Senegal treaty is purple. While it looks to be about average for both countries, it is certainly one of the more restrictive (“residence-based”) treaties signed by developing countries in recent years. This seems to be typical of treaties signed recently by the UK, but a worse deal for Senegal than it has obtained for a few years. The implication that the UK is one of the toughest tax negotiators with developing countries is surely worth political interrogation, at a time when its Department for International Development is urging developing countries to improve tax collection. It’s been quiet on here because of a field trip in Thailand, Vietnam and Cambodia, of which more anon. In the meantime, I’ve been given the opportunity to present a paper based on a chapter of my thesis several times this autumn. It’s a historical study of the politics of Britain’s tax treaty negotiations. I presented it at the excellent African Tax Research Network conference earlier this month, where a few treaty negotiators told me it was interesting to see what goes (well, went) on behind the scenes on the other side. I’ll be giving it again at the Oxford University Centre for Business Taxation’s doctoral workshop, and as the papers there are posted online, I thought it might be time to post it here, too. Why have developing countries concluded so many double taxation treaties with developed countries? Much existing research assumes that this diffusion results from the active pursuit of such treaties by developing countries, which have been willing to give up considerable taxing rights through them, in order to attract inward investment. 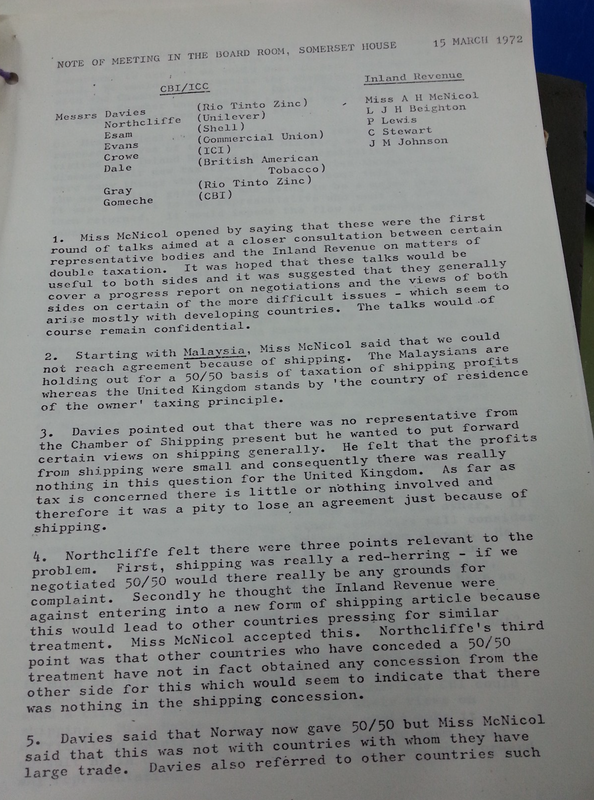 This paper uses archival documents to examine treaty negotiations between the UK and developing countries during the 1970s. It finds that in many cases negotiations were in fact driven by the UK as a means of increasing the competitiveness of British firms in developing country markets. It also reveals a divide between the tax specialist community, for whom tax treaties were a project to export ‘acceptable fiscal standards’, and generalists in business and government, for whom they were a means of securing lower effective tax rates. When these two groups’ objectives came into conflict, it was generally the experts who determined the UK’s policy objectives. Here’s a link to the PDF.